We are really excited about the Ireland Pilgrimage in April as we will be joined by Fr. Matt Guckin from Philadelphia who not only is Irish but connects so well with each pilgrim. We have several people signed up to go who have traveled to the Holy Land at one time or another with us so that will add a unique dimension as well. If you've ever wanted to see the beauty of Ireland, this is a great opportunity. See more details here. Our May pilgrimage to the Holy Land with Fr. Mike Schmitz only has a couple seats available, so if you had your eyes on that one, act now! Contact Bonnie Lane 952-474-0903, goldeneagletraveltours@msn.com to find out how to grab the last seats! It has been several years, but Jeff will once again be teaching locally in the Twin City area. He will be presenting an 8-week "Journey through the Bible" at St. John the Baptist in New Brighton, Minnesota! This class is open to all and offered through the Catechetical Institute. Tell your friends and sign up together! Course Description: "A Journey through the Bible"
This eight-part Life Skills course provides the easiest way to understand the Bible, helping you uncover the story woven throughout Scripture so that you can get the “big picture” of the Bible and understand what it is all about. "A Journey through the Bible", taught by Jeff Cavins, meets every Thursday from Oct. 5 - Nov. 30 from 7pm to 9pm at St. John the Baptist in New Brighton and utilizes the "Unlocking the Mystery of the Bible" materials while tying in the teachings of the Catechism of the Catholic Church. CI Offering Open to All! If you've never gone through the Bible Timeline, you won't want to pass up this opportunity. If you went through it years ago, you'll be amazed at how much more the scriptures come to life now that you have made the journey through the Catechism. This Life Skills course, taught by Jeff Cavins, is open to all. Start praying today about who you can invite to join you this fall on this great adventure! Want to know how to mark your Bible? 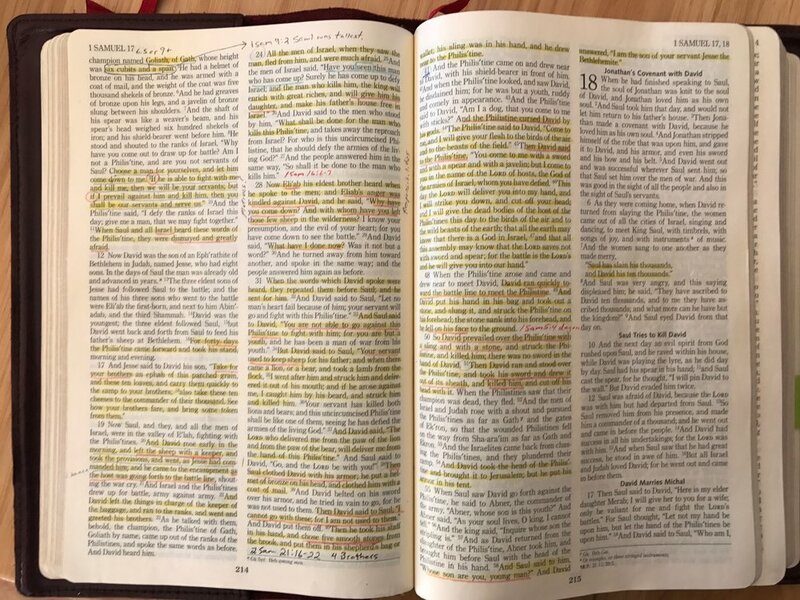 For forty years Jeff has been fascinated with the Holy Bible and has been reading and marking in his (more than one Bible in the span of 40 years!). Jeff shares his insights and methods on marking a Bible on the Jeff Cavins Show episode #10, complete with pictures and practical tips.